General medicine, Lymphoma, Primary cutaneous B-cell lymphoma Cutaneous B-cell lymphoma – cite! Cutaneous B-cell lymphoma (message) Cutaneous B-cell lymphoma – participate! Salmon-colored area and serpentine blood vesselsare the part of the circulatory system, and microcirculation, that transports blood throughout the human bodyThis glossary term has not yet been described. in primary cutaneous marginal zone lymphomaThis glossary term has not yet been described. Only few studies evaluated the diagnostic value of dermoscopyThe examination of [skin lesions] with a 'dermatoscope'. This traditionally consists of a magnifier (typically x10), a non-polarised light source, a transparent plate and a liquid medium between the instrument and the skin, and allows inspection of skin lesions unobstructed by skin surface reflections. Modern dermatoscopes dispense with the use of liquid medium and instead use polarised light to cancel out skin surface reflections. in cutaneous B-cell lymphomas. Primary cutaneous B-cell lymphomas are classified into 3 main types: primary cutaneous marginal zone lymphoma, primary cutaneous follicle center lymphoma, and primary cutaneous diffuse large B-cell lymphoma – leg type, and all three types show similar dermoscopic characteristics. 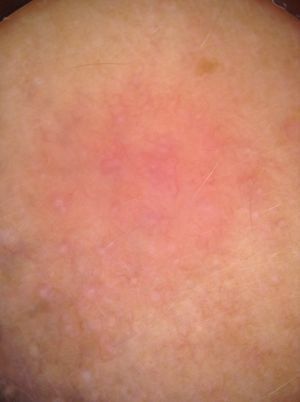 Although not specific, the most common dermoscopic features are salmon-colored background/area and blood vessels, most frequently serpentine (linear irregularlinear vessels with multiple bends) vesselsThis glossary term has not yet been described.. White circles were also reported to be a common finding. Other vascular morphologies, scaling or ulceration can be seen less frequently. DermoscopyThe examination of [skin lesions] with a 'dermatoscope'. This traditionally consists of a magnifier (typically x10), a non-polarised light source, a transparent plate and a liquid medium between the instrument and the skin, and allows inspection of skin lesions unobstructed by skin surface reflections. Modern dermatoscopes dispense with the use of liquid medium and instead use polarised light to cancel out skin surface reflections. can assist in distinguishing between cutaneous B-cell lymphoma and other differential diagnoses that present as solitary or grouped pink lesions. ↑ 1.0 1.1 Geller et al. : Dermoscopy and the diagnosis of primary cutaneous B-cell lymphoma. J Eur Acad Dermatol Venereol 2017; PMID: 28846171. DOI. ↑ Mascolo et al. : Dermoscopy Pattern, Histopathology and Immunophenotype of Primary Cutaneous B-Cell Lymphoma Presenting as a Solitary Skin Nodule. Dermatology 2016;232:203-207. PMID: 26694025. DOI. This page was last modified on 29 November 2017, at 22:55.